Celebrating New Year's Eve is one of those things that you either acknowledge with a bang or you let it sneak in quietly. Lots of San Diegans like to head to big events to celebrate with the rest of their friends and community. And that's cool, too, because San Diego has a couple of longtime traditions for ringing in the New Year. San Diego may not have an established gathering spot, like New York City's Times Square or even Seattle's Space Needle, but there are still big bashes where you can go party or family-friendly events you can head to with kids on New Year's Eve in San Diego. In addition, many hotels and restaurants around town have special New Year's Eve dinner packages, if you feel like welcoming the New Year with a delicious meal. Here are a few suggestions to ring in the New Year with a bang. Websites and contact information is given so you can check on the details for this year. Just remember to be careful and don't drink and drive. In fact, the North County Transit District typically offers free rides and special late-night schedules on New Year's Eve. Big Night San Diego is a popular party option for New Year's Eve in San Diego due to its size and because of the all-inclusive price. Your ticket includes everything (yes, all drinks included all night) with no long lines. Plus, there will be a food buffet and entertainment throughout the 12 different party zones. All you need to do is remember is your ID, because you must be at least 21 to attend, and get ready to have a memorable time ringing in the next year. Hilton Bayfront, One Park Boulevard, San Diego, CA 92101. The National Comedy Theatre does an annual New Year’s Eve Spectacular. Similar in style to Drew Carey’s “Whose Line is it Anyway,” the National Comedy Theatre (NCT) is a fun improv comedy show that is based completely on audience suggestions. In addition to the comedic entertainment, the New Year's Eve Spectacular will have catered food and an after-show party with the cast plus a countdown to the New Year. This nationally acclaimed show is appropriate for all audiences. 3717 India Street, San Diego, 619-295-4999. Saunter aboard a $25 million dollar yacht and feel like a celebrity as you enjoy unlimited beer, wine, top-shelf liquors, hors-d'oeuvres, chocolate fountains and other tasty delights during the New Year's Yacht Party. This event has three levels of music including a hip-hop dance deck, a legendary 80’s all-stars cover band and a variety of smooth tunes on the open air deck. Enjoy a great view of the New Year's Eve fireworks in San Diego, too, while on board. 1800 North Harbor Drive, San Diego, 619-246-3625. VAVi Sports Leagues and Social Events hosts a fun event each New Year's Eve called the NYE Beach Party at the Catamaran Resort and aboard one of the resort's historic sternwheeler boats. An all-inclusive ticket to the party includes drinks, hors-d'oeuvres, entertainment, expanded bar service—more bars and bartenders, expedited first drink for each party guest, four rooms of top-tier DJ entertainment—and a ticket for a boat ride on the bay (two different times are available when you book your ticket so you can decide whether you'd rather be celebrating New Year's Eve on the boat or on land). 3999 Mission Boulevard, San Diego, 858-273-3485. If a nice dinner and festive atmosphere are more your speed, and you don't want to be locked into one enclosed space, the restaurants of the Gaslamp Quarter is your best bet. Virtually all of the venues have some sort of New Year's Eve package, and you can take in the revelry of Fifth Avenue as well. A San Diego tradition that is free for the whole family is to gather with the community and watch the skies light up with colorful bursts of light. 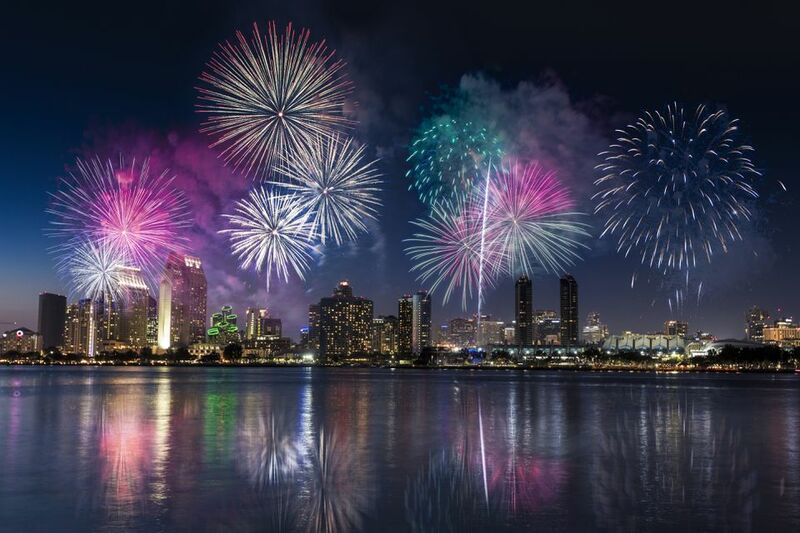 The exciting fireworks are hosted by Downtown San Diego each New Year's Eve. At midnight, after the countdown, you'll enjoy this free pyrotechnics show. The best views are from spots including Embarcadero Marina Park South, behind the Convention Center, the USS Midway Museum, and Seaport Village.